Ask Questions, Get Help, Find Solutions. 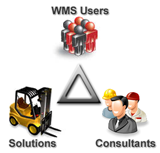 We have the LARGEST supply of WMS job listings. Find a consultant to help with a new implementation, upgrade, or general support. Welcome to the WMS Support Forum. We found that if you had answers to your WMS questions, there wasn't really a place to be able to ask a community. So here it is. We've also got a Blog section. If you are interested in a premium account to add your blog, job posting, or advertising, please contact us.